by Anderson, Lydia E.; Bolt, Sandra B. <>NOTE: Before purchasing, check with your instructor to ensure you select the correct ISBN. Several versions of Pearson's MyLab products exist for each title, and registrations are not transferable. To register for and use Pearson's MyLab products, you may also need a Course ID, which your instructor will provide. 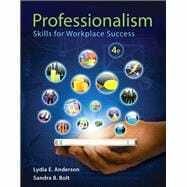 Professionalism, 4/Eprepares students for their first professional job, providing career planning tools, expected behaviors, and soft skills essential for career success. Ample exercises and activities help students immediately apply concepts and materials for transitioning from the classroom to a work environment. Three pillars for professional success–life planning, workplace skills, and career planning–are emphasized throughout. Students learn to connect personal, professional, and financial goals and understand how these goals ultimately contribute to career success through the creation of a life plan that addresses short- and long-term personal, professional/career, and financial goals. Recognizing that attitude, communication, and human relations are the keys to surviving in today’s challenging, competitive, and uncertain workplace, students will develop practical human relations skills with a primary emphasis on soft skills and expected workplace behaviors; and are provided detailed career planning tools that focus on job search strategies, résumé package development, and interview techniques. This title is also available with MyStudentSuccessLab–an online homework, tutorial, and assessment program designed to work with this text to engage students and improve results. Within its structured environment, students practice what they learn, test their understanding, and pursue a plan that helps them better absorb course material and understand difficult concepts. Lydia E. Anderson has a master’s in business administration with an emphasis in marketing. In addition to years of corporate marketing and strategic planning experience, she has been teaching for over eighteen years in both community college and university settings. She is currently a tenured faculty member and former chair of the Business Administration and Marketing Department at Fresno City College in Fresno, California. She also serves as an adjunct professor at California State University, Fresno. Her teaching areas of expertise include human relations in business, management, supervision, human resource management, and marketing. Ms. Anderson is also active in (California) statewide business curriculum development, student success and enrollment management initiatives, and in Academic Senate. She regularly consults with corporations on business topics relating to management and marketing to ensure currency in instruction. Sandra B. Bolt has a master’s in business administration with an emphasis in human resource management. She has been teaching in the college setting for over twenty-four years. She is currently a tenured faculty member and past chair of the Business and Technology Department at Fresno City College in Fresno, California. Her teaching areas of expertise include workplace relationships, office occupations, office technology, résumé/interview, business communication, document formatting, and computer applications. She currently serves as the Secretary/Treasurer of the State Center Federation of Teachers. She has extensive secretarial, treasurer, and leadership experience and has served as a computer applications trainer. She has led personal financial management sessions for community groups. She has been a volunteer guest speaker at professional conferences and high school career fairs, in addition to her involvement with committees and student functions at Fresno City College. Both authors have used their professional, educational, and personal experiences to provide readers with contemporary, realistic stories and challenges experienced in a typical workplace.